Well don’t panic, not just yet. I’ve assembled this quick guide with things you need to know, to help you get that print piece out the door, with as few hiccups as possible. Now I’m not going to try to teach good design or layout practices, or even teach you color theory. What I will point out are the things that will help you understand what the printer is asking for, and what this means to you so that you can get that document or ad completed. Below are some basic terms and their definitions. Often times these are thrown around as if everyone knows what they mean, but the truth is that most people don’t. These simplified explanations will help make sense of these terms without over complicating the issue. CMYK – Stands for Cyan, Magenta, Yellow and Black. These are the colors that will be used to print your document or ad, so your ad MUST be designed using CMYK. The printer will use these four colors to create all of the colors you have in your document. RGB – Stands for Red, Green, and Blue. RGB is only used in a digital environment. Meaning, your TV or computer uses these colors. Unless you are designing an online ad, RGB is not what you want for print design. It’s important to only use the CMYK color mode on all print related items. Are you asking yourself what 4/4 or 4/0 means and what the difference is? Well, really this is an easy one; once you know it, you’ll be able to speak “the speak”. Let’s start by using a postcard as an example. The first number tells the printer how many colors you plan to print with on the front of the postcard. If it’s a 4, than that means it will be printed in full color using CMYK (refer back to CMYK vs. RGB). A 1 means that you are going to print black ink only and a 0 means nothing is to be printed (although 0 is usually used for the backside of pieces like plain postcards, posters or letterheads). Similarly, the second number means the same thing, except it is referring to the back of the postcard. Therefore, 4/4 means that you will be printing in full color on the front and back of the card, while 4/1 means full color on the front and black ink only on the back. In most cases it will cheaper for you to print in fewer colors. For example, a 4/1 card will be cheaper than a 4/4 card. Have you heard the term bleeds before for printed material? Well I can say it’s not the gory mess you may think that it is – who wants their posters or business cards to “bleed” right? Well, a bleed refers to the excess graphics that are needed beyond the edges of your print document to ensure that when the piece is trimmed the color and graphics go right up to the edge. To determine if you have a bleed or not take a quick look at your document. Do you have a picture or color that runs off the edge of the page? If so, you have a bleed. If all of your pictures, graphics or colors stop and have a space between them and the edge of the page (unprinted space around the whole document) then you have no bleeds. Pretty simple, right? Well you may ask why is this is even important. If you are going to have bleeds on your document, than your printer needs to know ahead of time. The reason for this is because documents that have a bleed need to have artwork created that extends beyond the actual page size. The printer will actually print the piece on larger pieces of paper, and then cut it to size. That is how they get the ink to lay perfectly to the edges. In most cases a document with no bleeds will be cheaper, as there are fewer steps involved to create them. I’m sure at some point someone has asked you for a “high resolution” picture, or a “print resolution” graphic. This can sometimes throws a lot of people for a loop, and this one topic could probably have its own 3 part blog by itself, so I will try to keep this as simple as possible. When we talk about resolution we are talking about an image’s DPI (dots per inch) at its current size. Graphics for Print: We normally need print images to be at 300 dpi, at actual size, to ensure a clean, crisp image. This is primarily because printers print with more dots per inch. A “dot” is a spec of color (cyan, magenta, yellow or black) from the inks that are used. 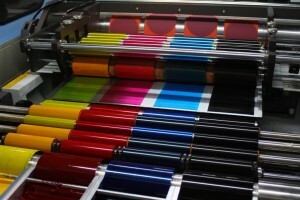 For clear print pieces you need dense, high quality color distribution. Graphics for Web: Images for the web can be a lot smaller at only 72dpi because your screen only displays with 72 dots per inch. So, how does this break down? For our example, we’ll take a 5”x5” image. For use on the web, it only has to be 72 dpi resolutions; therefore, you are looking for an image that is 360x360 pixels (72 dots per inch x 5 inches = 360). Whereas in print, that same 5”x5” image needs to be at least 1,500x1,500 pixels (300 dots per inch x 5 inches = 1,500). At the end of the day, and to keep your sanity, you will ALWAYS want to start with the largest size photo you can on your print projects. This means that for a printed piece, more often than not, you can’t just pull an image off the web because it won’t be at a high enough resolution. The last item we’ll talk about is file sizes. For someone that doesn’t design for a living, you would think that there would only need to be one size for the document. Well, that’s only partially true, because there is more to it. Let’s jump into what I mean and we can go from there. Trim Size: This is probably what you know the document size to be. This will be the finished size of the document. Simple, right? Live Size: This is what is considered the “safe area” within the document, which is usually .25” or .5” within the trim size. The importance of this is to make sure that none of the content accidently gets trimmed off if there is a slight misalignment in any of the printing processes. This is why it’s also referred to as the “safe area”. Bleed Size: We already discussed what bleeds are earlier, but this measurement just gives the designer an actual amount to extend the artwork outside of the trim size. If you remember, the document will be printed larger than the finished trim size, and then in a later process it’s trimmed down to the finished trim size. 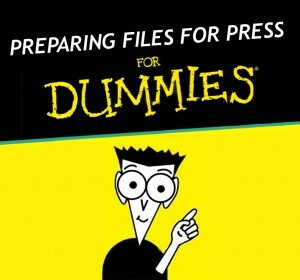 Well, that wraps up the basics of preparing files for print. Are you lost? Did any of this clarify the unknown? I realize at the end of the day, you still will have your designer do this work for you as they should, but perhaps the information above will help you out of a jam one day. Did I leave out a lot of information in this article? Yes, but the key was to communicate the basics of this somewhat mysterious topic and you can choose if you want to build on it from there. Sometimes the basics are the hardest thing to get. KathodeRay Media offers a free step-by-step branding checklist that will guide you through every part of the branding process.